Most of us want to look smokin’ hot at the office Christmas party and other holiday events. Yet, somewhere between last night’s cookie binge and the expectation that every gift, package, and presentation of yourself be just right, you start to feel…not so great. During these times the inner critic begins to assert, and it’s not uncommon to take the stress out on yourself. One form of self-sabotage is poor body image, and here’s what to do if you are suffering from it. Let’s put the blame on cookie consumption aside. Body image concerns, including body checking and weight obsession, often show up as distraction during times of strong emotions and high stress. These are basically maladaptive coping skills; focus on the body is a subconscious effort to gain control. · You’re off of your routine. From last minute shopping to holiday parties and events, you just don’t have time…for your workout, for a moment of rest, for yourself in general. The lack of control you feel in life may be subconsciously compensated by an increased focus on your body. · The foods you eat are sweeter and heavier than usual--both of which can trigger feelings of physical heaviness or bloat, as well as emotions such as guilt and/or shame. These strong emotions are key triggers for poor body image and scrutiny. · You’re tired. When you’re tired, your emotional defenses go down. You may eat or consume alcohol for comfort, or the exhaustion may lead to an increased experience of emotional sensitivity and stress. Here again, you focus on your body as a means of gaining control. Do you see the unfortunate loop here? 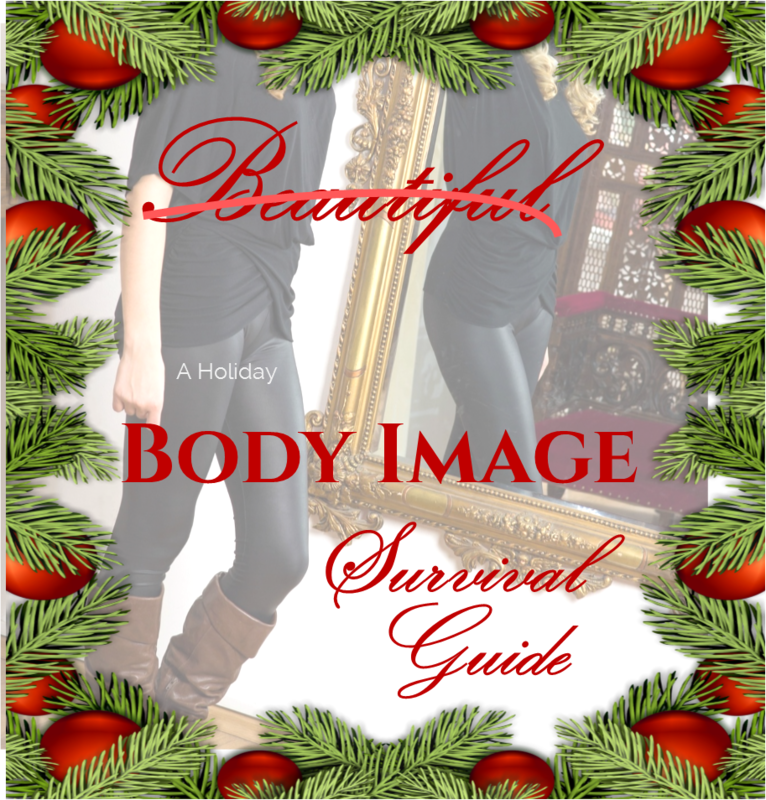 The holidays offer a perfect storm of opportunity for negative body image to get out of control. 1. Try to take regular, brief pauses to stretch and breathe deep. Stress and strong emotions can be effectively managed by a yoga practice--even a brief, gentle class or chair-seated yoga. Research demonstrates that yoga decreases the production of the stress hormone cortisol. People who practice yoga regularly also report a measurably higher rate of self-acceptance than the general public. Even if you pause for just a few minutes of stretching and breathing, you mind-body will appreciate the pause: your inner critic will be quieted, your stress symptoms will be decreased, and the strong emotions that trigger the body image concerns in the first place will be eased. To watch a free 20-minute chair yoga practice, click here. 2. SKIM Draw your feelings and frustrations—no artistic skill is required! SKIM Drawings are quick, scribble-doodle drawings followed by a brief journal practice with the image. The technique will immediately get you out of your head and into your heart, restoring your experience of balance and perspective as you acknowledge your lurking emotions. To learn how to do a SKIM Drawing, go here. 3. Art + Yoga = Flow. A brief, combined practice of creativity, stretching, and deep, controlled breathing will SIMULTANEOUSLY decrease the experience of stress while helping you gain insight and perspective around triggering events and strong emotions. To receive an overview of the integrative technique, download my free e-book here. You’ll immediately receive an invitation to upgrade to a guided video version of the techniques for less than $10. For many of us, body image is the unfortunate place that our minds focus on when we experience stress, strong emotions, and physical exhaustion. When the Holiday social pressures begin to build, and you lack the time for your regular self-care, look for every window of opportunity—however brief—to breathe deep and tune in. A series of singular, small actions can go a long way towards helping you feel better. Jodi Gonzales ATR, NCC, RYT200. Jodi Rose is an artist, art therapist, author, yogi and coach whose mission is to empower creative people to achieve lasting personal change and breakthrough professional results. Using a unique evidence-based program informed by art therapy, positive psychology, neuroscience and yoga, Jodi shows her clients how to achieve peak performance, peace of mind, enhanced clarity, and improved creativity and focus. Jodi offers live and virtual presentations, group workshops, and retreat intensives. Follow Jodi Rose on Facebook , Instagram or Linked In. For more information email support@jodirosestudio.com or https://jodirosestudio.com/.